"All of the appropriate regulatory notifications have been made. An initial site assessment reveals evidence of a landslide in the vicinity of the pipeline. The line has been safely isolated and depressurized until a thorough investigation can be completed." Sunoco spokeswoman Lisa Dillinger said Monday in a statement to the Daily Local. No injuries were reported, but one home, two garages and several vehicles were destroyed by fires, according to the Associated Press. Interstate 376 was closed and the Central Valley school district also canceled classes. "I saw the ball of flames above the trees and it was easily 150 to 200 feet up in the air. It was serious," resident Chuck Belczyk told KDKA. An investigation into the incident is now underway. A landslide that happened near the pipeline could be a possible trigger. Nearly 5 inches of rain fell between Friday night and Monday morning, Trib Live noted, citing National Weather Service data. 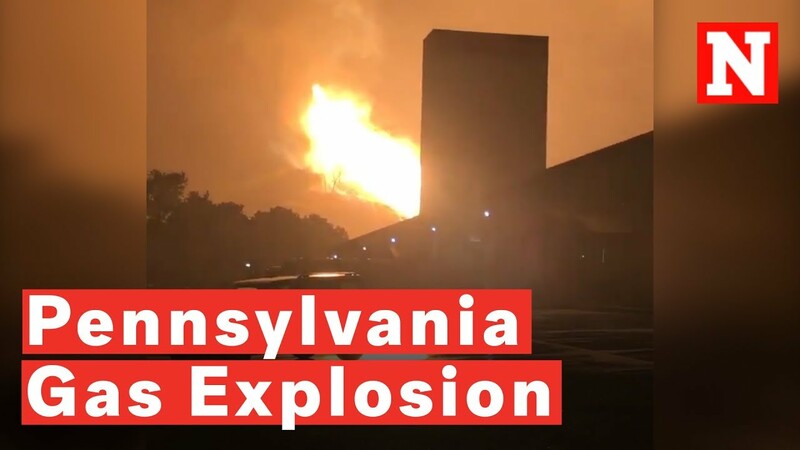 The explosion has prompted calls from environmentalists and lawmakers to halt the Sunoco's Mariner East pipeline, which is currently under construction in Pennsylvania. "I am calling for an immediate halt to all pipeline construction activities," State Rep. Chris Quinn (R-168) said in an online statement. "This pipeline should not be built until the real and legitimate safety and environmental concerns raised by myself and local residents have been fully addressed." State Sen. Andy Dinniman (D-19) tweeted that these kinds of pipelines should not be so close to schools, residential neighborhoods and community centers. "With every week we have more and more evidence why highly volatile natural gas liquid pipelines should not be in high-consequence areas and how Sunoco and Energy Transfer Partners have an abysmal track record when it comes to public safety," Dinniman continued. "The explosion in Beaver County is a chilling reminder of just how powerful and dangerous these pipelines can be." Energy Transfer Partners, which owns more than 83,000 miles of natural gas, crude oil, natural gas liquids and refined products pipelines, is the parent company behind the controversial Dakota Access and Bayou Bridge pipelines. Waterkeeper Alliance noted that the energy firm has had a history of pipeline accidents. "Waterkeeper Alliance and Greenpeace meticulously documented more than 500 spills and millions of dollars in fines and property damage by Energy Transfer Partners in a report released earlier this year," Waterkeeper Alliance staff attorney Larissa Liebmann said in a statement received by EcoWatch. Their April report found that Energy Transfer Partners, its subsidiaries including Sunoco, and joint ventures reported 527 hazardous liquids pipeline incidents to federal regulators from 2002 to 2017, or once every 11 days on average for 16 years. Monday's explosion, Liebmann continued, "proves that ETP is still putting lives at risk and cannot be trusted to operate pipelines safely, and is a grim reminder of our nation's need to quickly transition to clean and safe forms of energy like solar and wind." Sam Rubin of Food & Water Watch commented to the Daily Local that the explosion "is a terrifying reminder that pipelines fail." "Communities across the state face similar risks if the Mariner East 2 pipeline becomes operational," Rubin added. "Governor Tom Wolf has utterly failed to protect public safety so far, but there is still time to avoid catastrophe by stopping Sunoco's Mariner pipeline right now."